Building upon the creative achievements of artist, author, and children’s book illustrator Esphyr Slobodkina, we at the Slobodkina Foundation offer a model for individuals to live productively at every age through programs that enrich the minds of children and elevate the spirit of seniors. 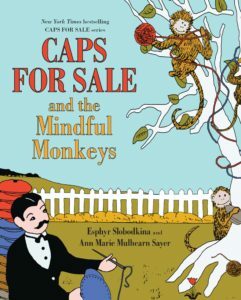 Many recognize Esphyr Slobodkina as the author and illustrator of the beloved children’s tale Caps for Sale. However, Slobodkina produced 22 children’s books during her lifetime (either as author or illustrator or both). Her very first book, Mary and the Poodies, was never published. Nevertheless, this delightful story with its innovative collage illustrations captured the interest of children’s book author Margaret Wise Brown, with whom Slobodkina would form a close professional and personal relationship. Slobodkina collaborated with Brown on The Little Fireman (1937), the first American children’s storybook to be fully rendered in cut-paper collage.